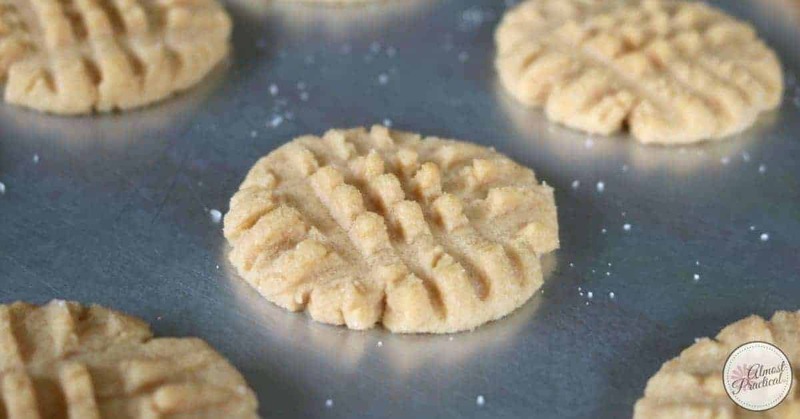 This soynut butter cookie recipe is as good as it gets and it's a great alternative to peanut butter cookies for people that have a peanut allergy. 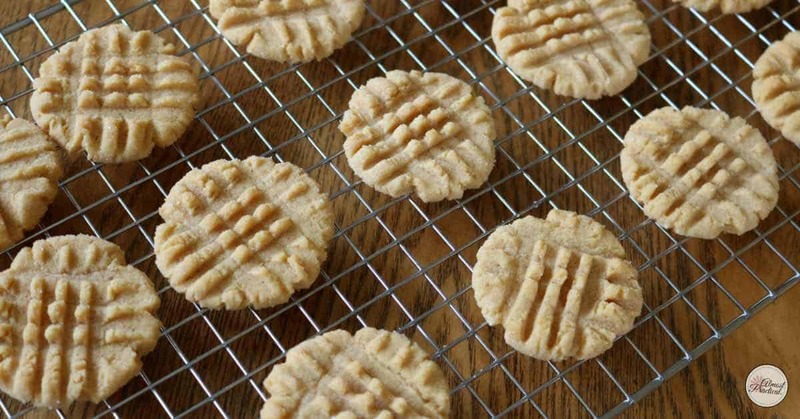 As a peanut butter cookie lover, I have to say that the texture of these soynut butter cookies is little different. These cookies have more of a, well, powdery type taste. 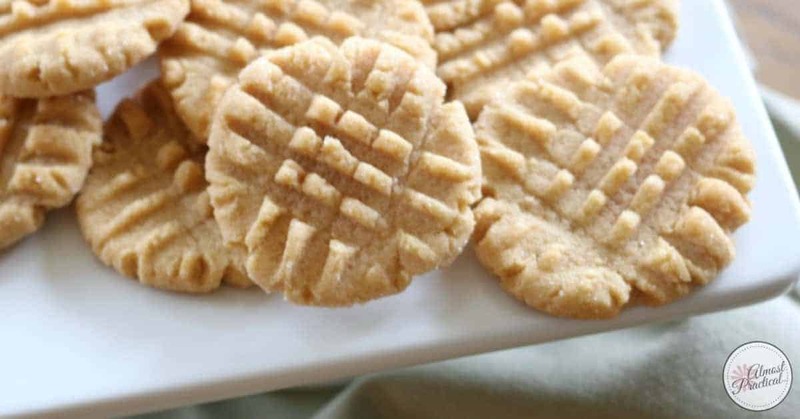 This soynut butter cookie recipe is pretty easy to make. You cream the butters. Then toss the sugars into the mixer, followed by the eggs and vanilla. Then add these to the butter and sugar mixture – and beat with your mixer until it's all combined. Roll the dough into one inch balls and then roll the balls in some granulated sugar to coat. Place the dough balls on an ungreased cookie sheet about 2 inches apart. 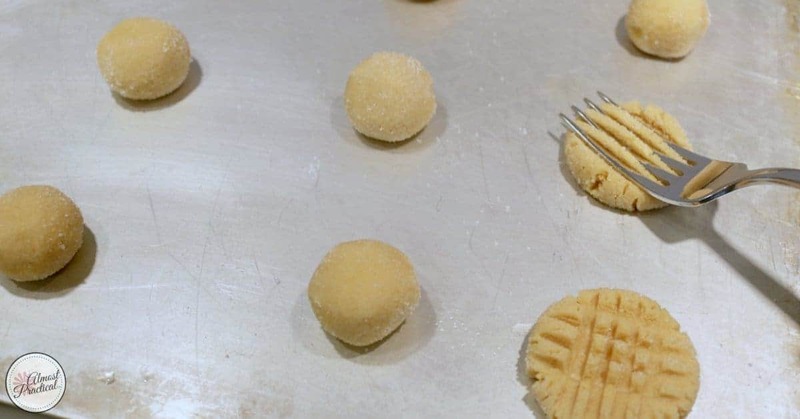 Then using the tines of a fork, flatten the dough balls by making the traditional criss cross pattern that you see on regular peanut butter cookies. Bake in an oven that is preheated to 375º for about 8 minutes. This is very important – when you take the cookies out of the oven, let them cool on the baking sheet for about a minute before you transfer them to a cooling rack. 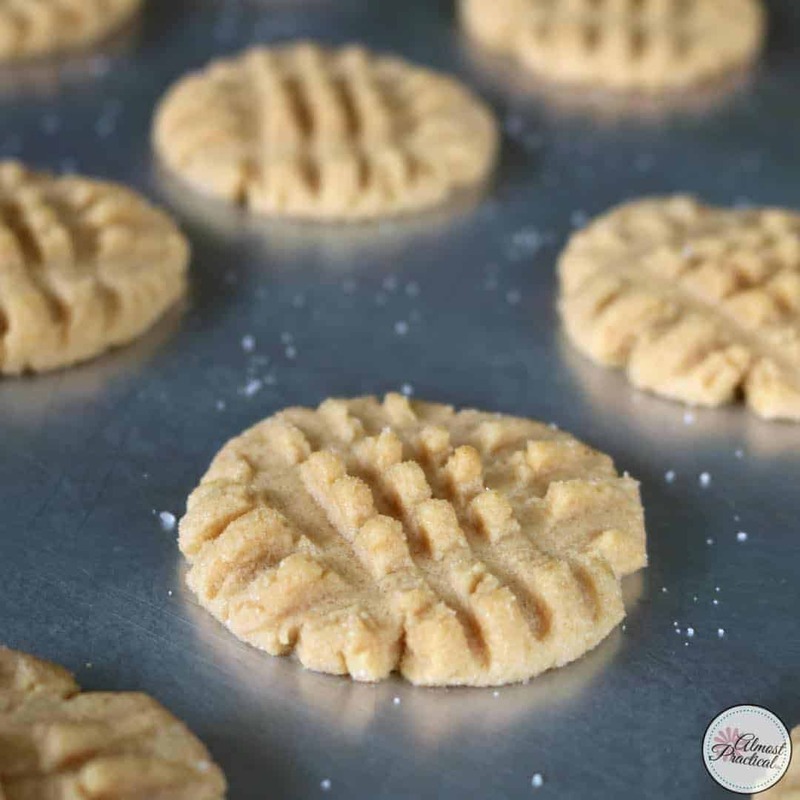 When the soynut butter cookies are super hot – they are very brittle, and they will tend to fall apart if you transfer them too early. So, let them cool on the baking sheet for a minute before you move them. Cool completely on a wire cooling rack and store in an airtight container. 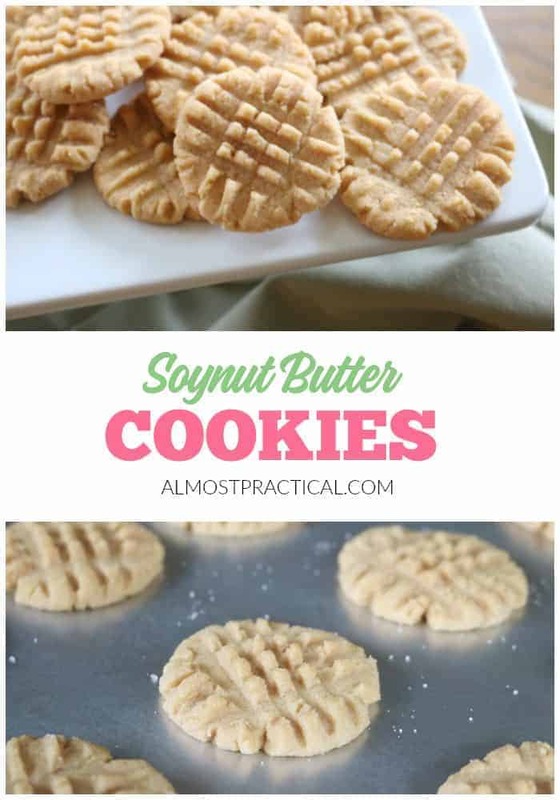 For this soynut butter cookie recipe, I used the creamy, peanut free Wowbutter brand of soynut butter which is the only kind that I can find in my local supermarket (thank goodness we like it ;-)). The consistency is very thick and creamy. I am just pointing this out because the consistency of every brand of soynut butters, or even regular nut butters for that matter, is very different. 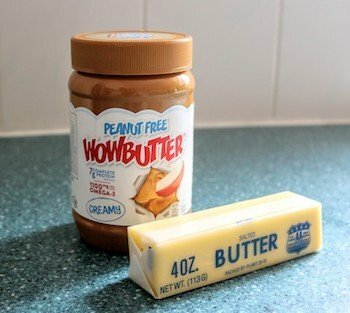 Just look at this comparison of Jif Regular peanut butter vs. Jif Whips and you will see what I mean. Cream the butter and the soynut butter together in a mixer on high speed until well combined and creamy. Toss in 1/2 cup granulated sugar the brown sugar, and beat on medium speed until combined. Add the egg and the vanilla and continue to beat on medium speed until combined. In a medium mixing bowl, combine the flour, baking soda, baking powder, and the salt. Add the dry ingredients into the butter mixture and beat on low speed until combined. Roll the dough balls in the small bowl of granulated sugar to coat them with sugar on the outside. Put the sugar coated dough balls about 2 inches apart on an ungreased cookie sheet. Important: let the cookies cool on the cookie sheet for about a minute before you transfer them to a wire cooling rack. The cookies are very brittle when hot and will fall apart if you move them too early. After a minute, transfer the cookies to a wire cooling rack and cool completely. What are Some Ways You Manage Peanut Allergies? If you or someone in your family has a peanut allergy – share your tips for managing it and keeping safe in the comments below. Thanks for sharing this recipe! My kids have food allergies (we’re milk, egg, peanut, and tree nut free in our house), so I’ll try this recipe with applesauce instead of the egg. I’ll let you know how it goes! I’m excited to try it! Multiple food allergies are definitely a challenge – I’ve been there. You probably know about the Ener-G Egg Replacer powder, but if not – I know I have had good results using that in the past (but I recall using more than the amount stated on the package).